In part 2 of our interview with Rosanne Buzai of Snowy Joey we dig deep into what it costs to start and operate a shaved ice business. We also discuss how to differentiate your business and the serious question you need to ask yourself before starting this type of business. Answering this question honestly could be the different between the success and failure of your future stand. If you haven’t heard part 1 of this interview yet, click here. Cost will vary depending on cup size, quality and different sizes you select. Variable Costs: There are of course a number of variable expenses associated with starting a shaved ice business. The primary expense will be determined by the unit you use to run your business. If you plan to use a pop-up tent, you can get started for under $5,000. If you want to purchase a trailer the cost could be between $15,000 – $100,000 depending on how many bells and whistles you want on your vehicle. The Tiki hut or stand cost can also vary greatly, but a typical stand should run you under $10,000. What is an Average Day in the Life in Your Shaved Ice Business From an Operations Standpoint? As Snowy Joey business has continued to grow the daily responsibilities and work has also changed for its owners. In the early days with only a single shaved ice machine, the Co-Owner of Snowy Joey, Chris would be working small events around by himself or with a friend. It was basically a one many show to setup the shaved ice equipment, work the events, make the ice, and book future gigs. Things were simple and lucrative in the early days since a solo business owner could handle the majority of the work even in their spare time. Fast forward about ten years into the business, Snowy Joey now owns about 12 shaved ice machines, five popcorn machines, 12 cotton candy (or fairy frost) machines and their staff of employees is able to work multiple sporting or catering events at the exact same time. In total, Snowy Joey can now serve approximately 20 events over a single weekend. This changes the role and the responsibilities of the business owner, but it also increases the revenue significantly if you’re able to keep cost down. Today, much of Rosanne’s work is in handling the operational side of the business. Rosanne helps to book new business, works to ensure that there are enough employees to operate at each event. Since there are busy periods and slower periods in the business, Rosanne needs to juggle employees schedules a bit between those that want to work almost every weekend and those that only want to work occasionally to earn a few extra dollars. The other important role change that has occurred from the early days is that Rosanne spends much more of her time training employees. When you’re just a one man or woman show you need to wear every hat in the business. You literally do everything from sales to marketing to operations. But if you want to own a larger operation, you need to learn how to delegate and train different employees to pick up some of these tasks. One of the important jobs Rosanne has trained an employee to handle is identifying new vending locations. This is an important role because being on the look out for all the different fairs, sporting events, or craft fairs in the area is important to keep revenue coming in for the business. Finding new vending opportunities is completed in a variety of ways. It includes searching the internet for local events, keeping tabs of University / school websites, and local papers to see what’s happening around town.Rosanne has also delegated another important tasks like invoicing customers. You won’t need to hire out anyone to complete these tasks when you start out. But the more people you hire, the more events you do, the more administrative work that will need to get done. Being aware of this fact early on and being prepared to offload some of the routine, but necessary work is a requirement if you want to remain sane while operating a growing business. Testing Out The Franchise Model. After seeing success and growing their own shaved ice business, Snowy Joey considered expanding into a franchise operation. Starting a franchise can be a great way to grow an organization without having to hire a manager for each operation. Based on the success of the business, it seemed like an opportunity that could be replicated. The business did do an initial test run with a franchisee, but ultimately Snow Joey decided to remain a private operation. With most franchise opportunities there is a certain annual revenue expectation that franchisee’s expect to hit. While nothing in business is ever a guarantee, franchise’s can often give you a ball-park figure of how much you could expect to make based on the amount of foot traffic, population of a city, and location of your store. But… If you have a mobile business that works events, it complicates revenue estimates. This business model is highly weather dependent. If you have cool weather with rain, you aren’t going to have a great day in sales. If you have a summer that is unseasonably cold or wet, it can really hurt your year. The same goes for selecting events to vend at. Pick the wrong events and you won’t generate as much compared to someone had selected an event that was well attended and had nice weather. Due to all of these variables, Snowy Joey decided to remain a private company. Rosanne focuses on the experience of her customers as a way to differentiate themselves from all the other shaved ice vendors out there. 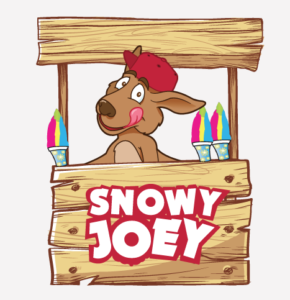 Now that Snowy Joey has been in business for a decade, there are kids that have grown up with the Snowy Joey brand of shaved ice. They remember how it felt to get shaved ice when they were kids and be able to pick out their favorite flavors themselves. If you focus on customer service and the experience of your customers, you will set yourself apart from ordinary vendors. 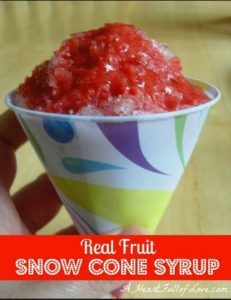 Biggest Piece of Advise When Starting a Shaved Ice Business? Before you ever start a shaved ice business, Rosanne recommends looking inward to determine if this is the right type of business for you. It’s easy to look at long shaved ice lines and the money you could make operating this business and think you will enjoy it, but remember there will be challenges too. This is something you will need to be brutally honest with yourself about. Sometimes a promoter will be completely off base with the expected number of people that will attend an event. There will be rain and wind that makes other events unprofitable. If you enjoy talking to people, being sociable and working at fun events like this it’s a great business to get into. At the end of the the day, you’ve got to really enjoy and be passionate about what you do. If you don’t enjoy it, you’ll probably quit before you start to see the big pay days because it will be too much work and too much of a grind. Everyone see’s these long lines at these events in the summertime when the weather is great and go “Oh wow! I can make so much money!” from this business. But they don’t realize that marketing is a really big part of any business. – Rosanne Buzai on what it takes to operate a successful snow cone business. What I tend to find with single operators is that they undervalue their time. – Rosanne Buzai shaved ice vendors and the importance of valuing the time you put into the business.